I have found the edge of the world. The wind is fierce here. And cold. I check that Arayo's collar is secure. Shorten the amount of play in her leash. Draw her closer. A strong blast of wind, a startling incident causing her to lunge, and our following moments would be a free-fall through the clouds. A landing on rock and water far below. The edge of the world calls me. Insists I move closer to the edge. It is like flying. I hate flying. Except now, with feet on solid ground. A piece of the edge of the world escaped. Years ago. Its rocks and crevices, a sanctuary for birds to raise their young. Lucky birds. Hundreds of puffins, those cuddly black and white birds with giant, triangular orange bills, return each year to this piece of the end of the world. Lay eggs. Raise babies. Leave for a winter less harsh. Today, as I peer at the cracked off piece of the edge, only Arayo and the seagulls keep me company. The puffins have gone. I listen to the wind calling me forward again. Maybe another peak. Off the edge. It is so beautiful here that I don't want to leave. Like the puffins, I know I'll return to this place. Where the world ends. 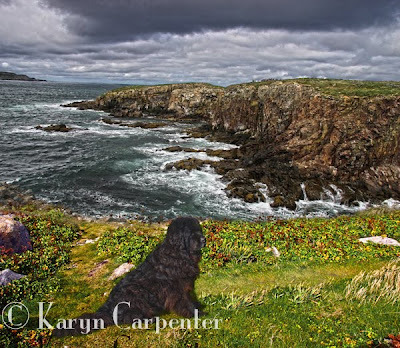 Photos: Arayo, at the edge of the world - Elliston, Newfoundland. Are you going to put all your wonderful pictures of NFLD in a book? I need one if you do. Sounds like you are loving the island as much as we did. You are blessed to be able to record it all with your camera. Take care. Beth and Ron Tickle too. Zena has crossed the Rainbow bridge.